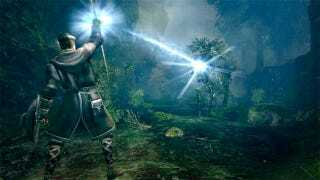 More than a quarter million masochists in Japan have snapped up a copy of Dark Souls for the PlayStation 3 , making From Software's punishing role-playing game the country's bestselling game. That's a big improvement over the Japanese debut of its predecessor, Demon's Souls, which bowed with about 40,000 in sales in early 2009. Japan's good taste this week extended to the PlayStation 3 remakes of Ico and Shadow of the Colossus, which sold more than 110,000 units combined. Gears of War 3 also managed to do quite well overseas, particularly for an Xbox 360 game, moving more than 50,000 copies week one, according to Media Create. You know what great game didn't fare so well? Grasshopper Manufacture's Shadows of the Damned. Less than 10,000 copies were sold at launch, almost half of Koei's latest horse racing sim, Champion Jockey: G1 Jockey & Gallop Racer. That's loco! Here are the top 20 games in Japan for the week of September 19 to 25. The hardware chart sees the Nintendo 3DS ruling the roost, moving more than 70,000 units—without much representation on the software side of things this week. PS3 and PSP sales were up for the week, but it was the performance of the Xbox 360 in Japan that stands out. Sales of Microsoft's console tripled this week on the strength of Gears of War 3.